The other night I had the most intense and sudden craving for something I haven't had in few years: my mom's rice pudding. I'm not sure what triggered it, but once the thought was in my head there was nothing left to do except go make some. I was even completely willing to pack up the kids for an emergency trip to the store if it was necessary! Fortunately, I had these few ingredients on-hand in my kitchen, so we were able to skip the family joyride to the supermarket that evening. My mom used to cook a little bit of this rice pudding for herself whenever we had leftover buttered rice from dinner. I remember questioning her about what she was making and thinking she had lost a couple of marbles. As a kid, white rice cooked in milk and sugar never sounded all that fantastic. Not at all. But, after several unsuccessful attempts to bait me, she finally talked me into taking a bite. Mom was right (trust me, she didn't hear that very often back then!) and I was immediately hooked by the creamy, richness of her old-fashioned, rice pudding. Now she makes this treat for herself when she wants a little bit of old-school, comfort food. She's told me, many times, that this is one of her favorite recipes from her childhood. She also always talks about my grandmother when she makes this rice pudding and how she loved it when her mama would make it for her. So, I guess I love this dish for a few reasons other than how ridiculously delicious it is. Now, I'm notorious cinnamon addict. So, of course, I played with her recipe just a teensy bit and added a teaspoon of my favorite warm spice while it was cooking down. Once I smelled the cinnamon in the air, I just knew that some toasted pecans would add a perfect bit of crunch to this creamy dessert. So, I grabbed a small skillet and my handy, dandy bag of pecan pieces and went to work! And, then the smell of the pecans toasting in the skillet made me think of maple syrup and a little drizzle just had to happen (oh, why not, right?). I can tell you that this turned out to be quite a decadent, little treat on a typical Tuesday night at my place. I know some people prefer rice pudding made with a with shorter grain rice like Arborio or some may use medium-grain rice. Shorter grain rices will certainly cook down to a smoother texture than traditional, white rice in this recipe. But, I grew up eating this with long-grain rice and that's just what feels like home to me. Maybe I'll break down one day and try this with a different type of rice, but you should use whatever style of rice makes you a happy camper. Also, lots of traditional rice pudding recipes use raisins in the dish. I'm not much for raisins at all, so they didn't make the cut here, but if you like them, why not toss in a handful? Evan was out of town for this little cooking adventure, and he was pretty jealous. But, I've already explained that I have no problem making this again as soon as he gets back! 1. Bring the rice to a boil in the salted water, cover and simmer until all the liquid is absorbed. This should take about 15 minutes. 2. Fold the butter and cinnamon into the cooked rice until the butter is melted and the cinnamon is well-incorporated. 3. Pour in the milk and half of the can of sweetened condensed milk. Stir well. Bring the rice and milk mixture to a boil and then reduce heat to simmer, stirring often, until the liquid cooks down and begins to thicken up. This should take about 25 minutes. 4. Once the liquid is significantly thickened up, turn off the heat and allow the rice pudding to cool for 20 minutes (if you want to serve it warm, now is perfect!) or to room temperature, if you prefer. 5. Top with toasted pecan pieces and little drizzle of maple syrup, if you want. Enjoy! I like the use of sweetened condensed milk in this rice pudding. Must be very delicious. There's nothing like the treats we enjoyed as a child to take us back in an instant. Food memories are so important and at this time of year, food enhances the joy of the season. 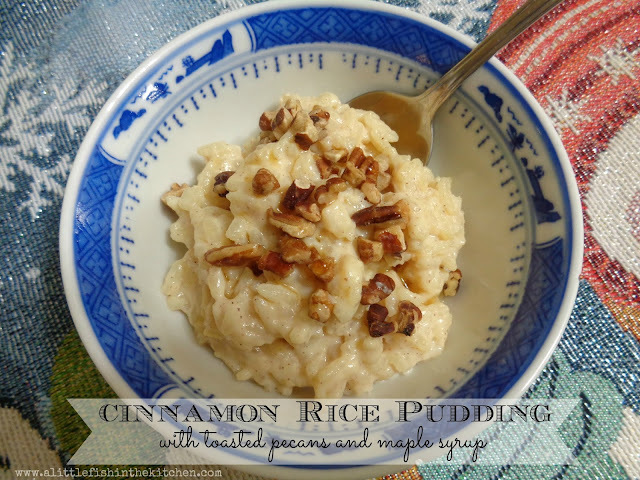 I've never had cinnamon rice pudding but I know I'd love it. i share your addiction of cinnamon! this is the perfect dessert for a chilly winter evening--the aroma alone will warm a person right up! My mom used to make me rice pudding too as I was growing up, I know I would love this. Thanks Marcelle! It's truly a treat in my book and I can't make this dish without thinking about my mom :) Thank you, Cheri! This dish really is old-school comfort food! My mom used to make a very similar recipe, too. I haven't had this in year -- thanks for bringing back good memories! For us, Marcelle, rice pudding is the ultimate comfort dessert. Yours is beautiful! 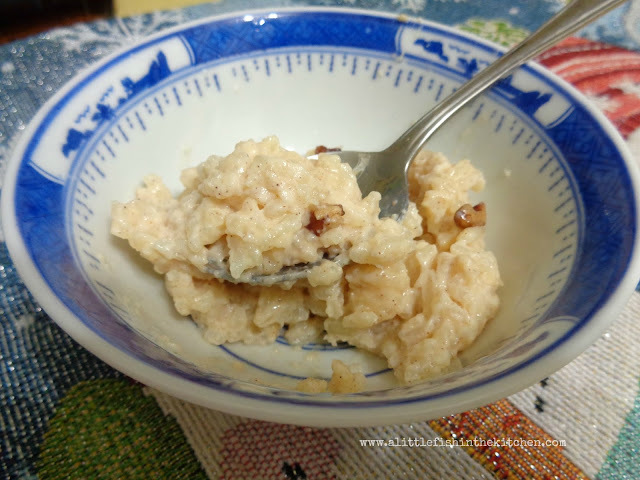 Marcelle, rice pudding - a perennial childhood favorite for so many of us! Never made it with sweetened condensed milk or nuts though - sounds delightful! What a great idea your mother had to not waste the leftover rice and use for this treat! My mom made this and I couldn't stop eating it from the pan! I have since been adding cardamom to mine...it's my latest obsession.